Just like humans pregnant cats need a lot of food that is rich in nutrients to ensure healthy development of the kittens. The important thing to remember is that the nutrients required by cats differ from human requirements and problems can arise if this is not understood. The following is a good feeding plan for pregnant cats, plus some things that should be avoided. 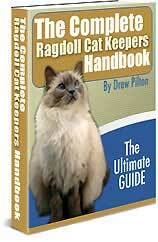 Ragdolls should be given a lot of adult food before and during the first four weeks of pregnancy. By the fourth week, start giving her premium kitten food as well. Gradually increase the amount every week so that on her final week, her diet consists entirely of kitten food. This is because foetal growth occurs mostly in the last two weeks of pregnancy, and the mother needs time to adjust to kitten food. Starting at mid-pregnancy, you can either free-feed her increase her meals to three to four a day. As the kittens grow rapidly in the last week, she may need to eat small meals every three to four hours, or up to two times her regular diet. This can continue up to the first four weeks of breastfeeding. Pregnant cats need plenty of water. If possible, get a drinkwell fountain to make sure she gets a fresh supply throughout the day. Add some canned moist food in her diet to help push out wastes. You can also give her kitten milk replacer in place of regular milk. It's normal for a cat to gain weight during pregnancy, but don't overfeed her or let her become obese. Too much weight can make her uncomfortable and make birthing difficult. Keep track of bodily changes such as water retention and swelling of mammary glands. Start giving her vitamin and mineral supplements early into the pregnancy. If she had been on supplements before getting pregnant, just keep giving her the same amount instead of increasing the dose. Over-supplementing can be harmful to the development of the kittens. Extended feeding should continue after the kittens are born. Feed her at least five times a day, and gradually introduce adult food back into her diet. Remember, she'll be eating kitten food exclusively before giving birth. Give her plenty of fresh water. On the first day she stops breastfeeding (about six weeks), don't give her any solid food. Feed her only small amounts for five days before returning to her regular diet. Consult your vet if your Ragdoll does not deliver within 65 days. Cats experience hormonal and metabolic changes during pregnancy, which may affect her food preferences. Be sure to keep her well-fed, but don't let her get obese. After about nine weeks, your cat may start refusing food. This can be a sign of oncoming labour; the litter may come in the next 24 to 48 hours. But if she refuses food early in the pregnancy, take her to the vet. Keep pregnant cats indoors, they are slower than usually and may not be able to defend themselves outdoors. If the cat is feral or a stray, remove any fleas and ask your vet for an anti-flea medication. Alfalfa contains a toxic compound called cyanogenic glycoside, which is normally destroyed by the liver in humans. Cat livers are much smaller, so the toxins will remain in their system. This can cause abdominal pain, vomiting, diarrhea, and severe indigestion. Alfalfa also increases the body's pH level. This can lead to the formation of urinary crystals in cats, whose normal pH is lower (acidic). Cats cannot produce the enzymes needed to break down plant matter. Even when pureed or powdered, vegetables simply pass through the digestive tract without leaving any of their nutritional content. This alone is not harmful to your cat, but when undigested plant matter mixes with highly digestible food such as meat, indigestion and other complications may occur. Grass is an exception, however. Some cats compulsively eat grass when you leave them outdoors. This will cause them to regurgitate indigestible matter, including raw vegetables, meat bones, or their own hair. This can be uncomfortable for your cat, but it's much safer than expelling it through the digestive tract where it can cause blockages. Your cat may eat indoor plants when there's no grass around, so have a regular supply of potted grass indoors. Common spices such as onions, garlic, chives, and shallots, and chives can damage the red blood cells and lead to haemolytic anaemia. Raw garlic contains high amounts of allicin, which creates free radicals that damage the cells and make your cat prone to disease. These spices are harmful whether raw or cooked, although raw onions may cause additional damage to the oesophagus, stomach, and the rest of the digestive tract. The cat's stomach provides an ideal environment for yeast to ferment. This can cause bloating, stomach upsets, and severe allergies. Baker's, brewer's, and nutritional yeast all have this effect in cats. Besides, the nutrients in yeast are available in other common foods such as meat, fish, and eggs. Vitamin C helps fight disease in humans, but cats get their protection from vitamin A. They create their own vitamin C from their small intestines, so supplemental vitamin C can lead to an overdose. This can cause oxalates to form in the urine, which can then accumulate in the cat's kidneys and urinary tract. It can also enhance iron absorption, which can lead to iron overdose as well. Also, cats don�t like the taste of vitamin C, so adding supplements to their food can discourage them from eating. Click Here To Download Your Copy Of The Complete Handbook!